I am trying to be a little healthier and exercise more frequently, although I think I'm kind of failing thanks to my love of eating even more, and my wife is very supportive of this goal. In fact, she also is trying to be healthier so we are working together toward this common goal. We also love to support friends and family who are struggling with illness and other issues. We have been known to travel for and run in fundraiser races, although we don't do it for times, but more to spend time together. Today happened to be one of those opportunities to run in a fundraiser race for a high school friend of my wife's. This friend is suffering with cancer for the second time and we felt that we needed to be there to support her and her family during this difficult time. So we loaded up the family and headed north to stay with my in-laws and then run in a 5K to support a friend. It was nice that we were able to stay with my in-laws because they love seeing the grandkids and my mother-in-law wanted to run with us as well. Me, my wife, and our daughter pre-race. We made it to the event and it was a cold morning! 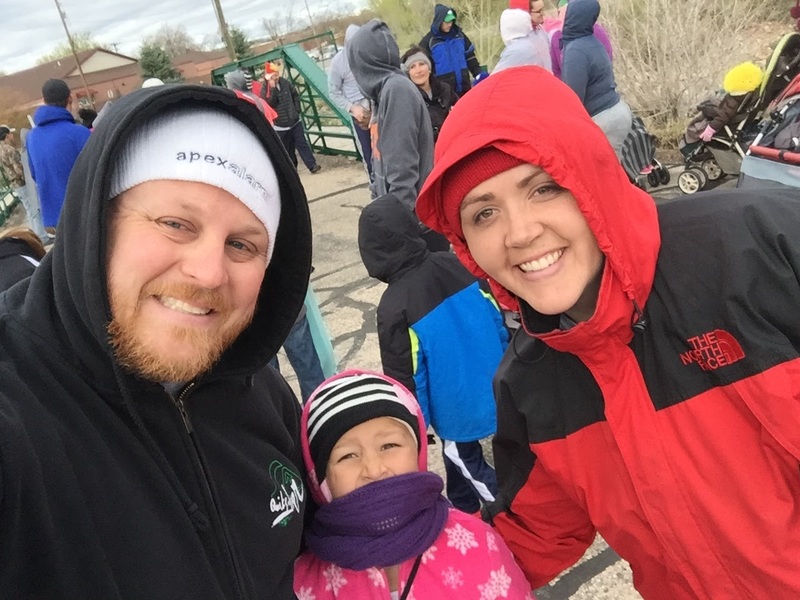 We were freezing but it felt good knowing we were there to help a friend and ourselves in a quest to get healthy. The best part, though, was that our whole family was there together and we were able to have a fun time doing something we don't do enough of. I really got a kick out of watching my 6-year-old daughter run ahead of us and act as our trainer because she kept telling us to hurry and go faster. What a tough girl! It was really nice to see all the support Christie and her family received with the runners, but it was even better to see a lot of other support via drawings, auctions, breakfast, bake sale, and an online store to help alleviate some massive medical bills. We did our part with my amazing mother-in-law buying a number of goodies from the bake sale, but I thought I'd share a link in case anyone else would like to donate to this amazing family. Christie's husband is a 3rd-grade teacher so he's part of our community and if you can spare anything, please don't hesitate to donate a little to their cause. I have a long past with cancer and hate what it does to families. I have lost three of my four grandparents to the disease as well as many other family members. I hope that one day we will be able to solve the riddle of cancer and find a way to beat it once and for all. I think that is one of my goals as an educator, to help get my students excited about school in the hopes that one of them may be the doctor to help destroy that family tragedy machine for good! But until that day, I'll keep teaching my students and keep hoping someone beats me to the goal!